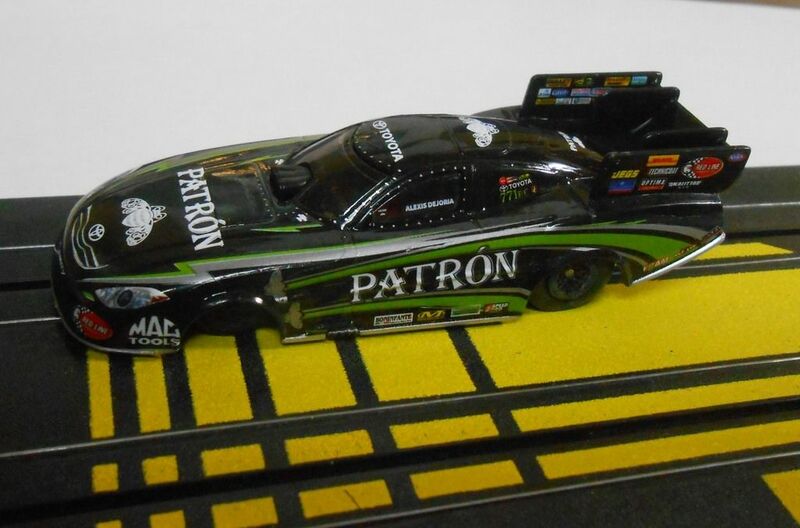 Best chassis to (really) fit the AW Funny Car bodies? Complete drag slot newbie here. Love the AW FC bodies, hate the way they fit on the chassis like 4x4 dune buggies. Is there another rtr chassis with a slimmer width that will pretty much let the tires snug under the bodies so I can lower them? I think I can fabricate mounting clips & dremel out the fender wells so they they are thinner but I don't want to have to completely scratch build/kitbash a chassis if I can avoid it. Thoughts? Thanks in advance! Welcome to the site downtowndeco! I have already shown you pics of my stuff on SCI. No matter which chassis you choose tires have to narrowed and mounts made in order to lower the body on the chassis. The easiest I have found to far is the JelClaw dune buggy or hot rod skinny tire. Just slip it on say Vincent wheels. Then sand it down until you reach the rubber on piece of 400 grit sandpaper and your done. The Vincent fronts are already skinny so work nicely. Are you talking AW Nostalgia Funny Cars or modern Funny Cars? 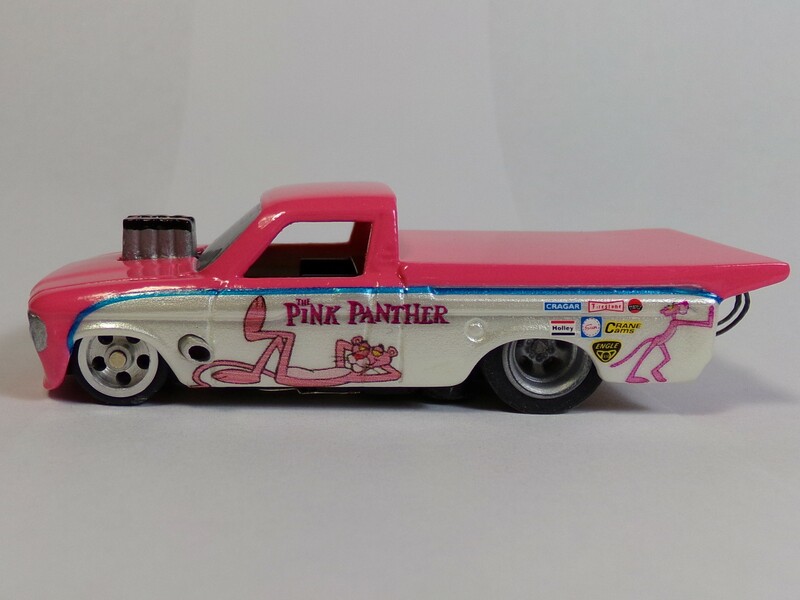 This car has AFX Magnatraction(Same "ish" size as Vincents) wheels and the tires Eagle is referring too. Note the screw post and the chassis mount attached to the inside of the silver windscreen part! You will need to fabricate those for this type of chassis. Cut the side mounts off the AW chassis and you have the same configuration. Thanks guys! What are these "vincents" you talk about? Welcome to nitroslots. downtowndeco. Here is another link to some great info. on the forum here that will address a lot of what you are wanting. Great info! Check out Slots n Stuff website as well for the Vincent wheels. At the bottom of the main forum page just click on their logo. Here is the link as well. I ordered some Jel Claws (dune buggy) for the back & some O Rings for the front, we'll see where that get's me for a start. I'm using a Mega G 1.7 chassis with one of the modern AW FC. Thanks for your help guys. What I'm trying to do is to just get OK running cars that at least have a somewhat realistic stance. Welcome to the site downtown. What's the size of those dune buggy tires when mounted on rims? Sam the ones I have on the Vincent wheels are .500. I have another wheel that I resin cast for Door Slammers, those are .540 with same tire. Thanks for the measurement Robert. I've been using Wizzard part #PVT05 from Luck Bob's. He also sells a narrow double flanged wheel to use with these tires. Double flange wheels come in 2 sizes, .250" and .275"
My first crude attempt at lowering a AW Funny Car & using a Mega G Chassis. First I clipped out the front axle (since the wheels are almost impossible to pull off). Next I snipped off the little bracing/extensions on the front of the chassis & filed it flat to gain a bit more clearance. I added a new axle tube & epoxied it in place a few hairs farther forward to better match the wheelbase of the AW FC bodies. Next time I'll move it even a smidge farther forward & use a brass tube, I just used what I had this time. 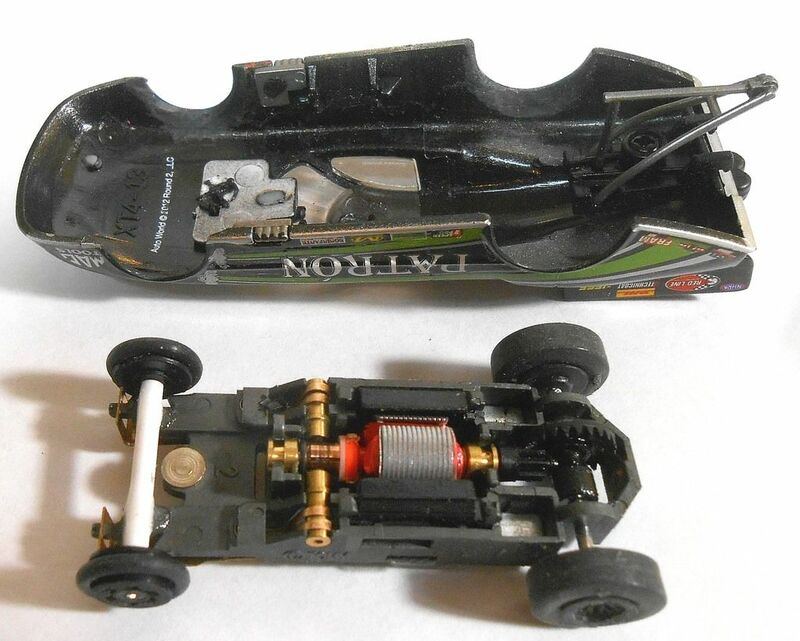 I replaced the front axle & wheels using a set off an older AFX car from the 90's I had laying around. I Shaved/filed the front wheels down to narrow them, and then I added O Ring tires. 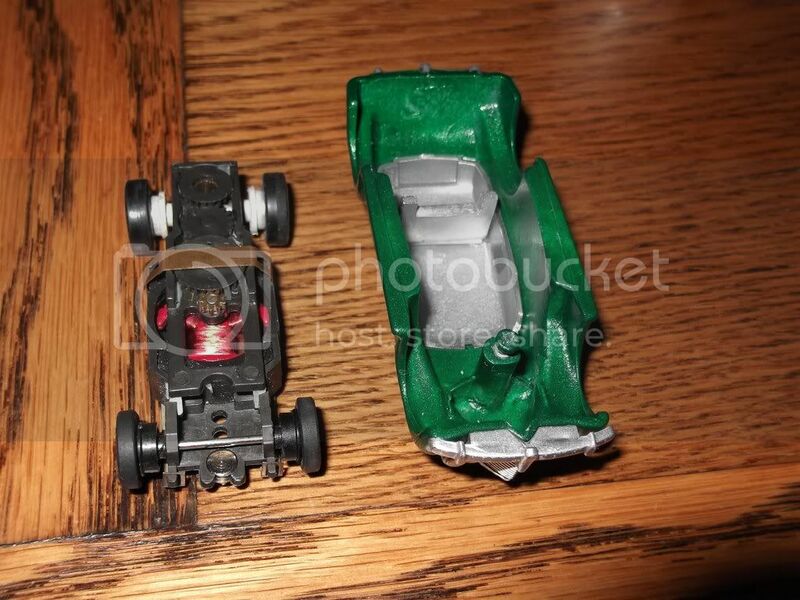 I shaved/filed down the rear wheels, and then replaced the slicks with Jel Claw Hot Rod tires. Don't look too close at the wheels, they're kind of crude but again, I was trying to use what I had on hand. I dremeled out the inside of the front & rear wheel wells. I still need to figure out a mounting system but to just test this I'm going to try 2 sided foam tape. Hopefully I've got enough clearance, if not I think I can shave a bit more off the inside of the wheel wells. nice work, looks so much better.